Scientists have videotaped sharks traveling a 500-mile-long "shark highway" in the Pacific Ocean. The team lowers the cameras. A map shows the location of the swimway in yellow. Biologists have been attaching electronic tags to sharks near Costa Rica for years. They knew the sharks sometimes traveled south to the Galapagos Islands, but they'd never actually witnessed it. And they needed scientific — and visual — evidence to make their case for protecting the route. To do that, they took some GoPro-style cameras and attached them to metal frames along with bloody fish bait. They're called BRUVS, for "baited remote underwater video system." The researchers dragged these contraptions behind a research vessel for almost two weeks. And they waited, and waited, spending hours watching live video of nothing but blue water — until dozens of sharks suddenly swam out of the gloom and into view. "Amazing," biologist Mario Espinoza says of the moment. "We actually documented over 16 species of sharks and fish, also sea turtles and dolphins. ... It's really surprising to see that many animals." Sharks dominated — mostly hammerheads but also thresher sharks and silky sharks. Sometimes a single video frame captured dozens of them. What the scientists were witnessing is a continuous "swimway" of large marine animals. It starts in Cocos Island in Costa Rica and extends to the Galapagos. The route follows a range of underwater mountains. Called sea mounts, some of their peaks extend fairly close to the surface. 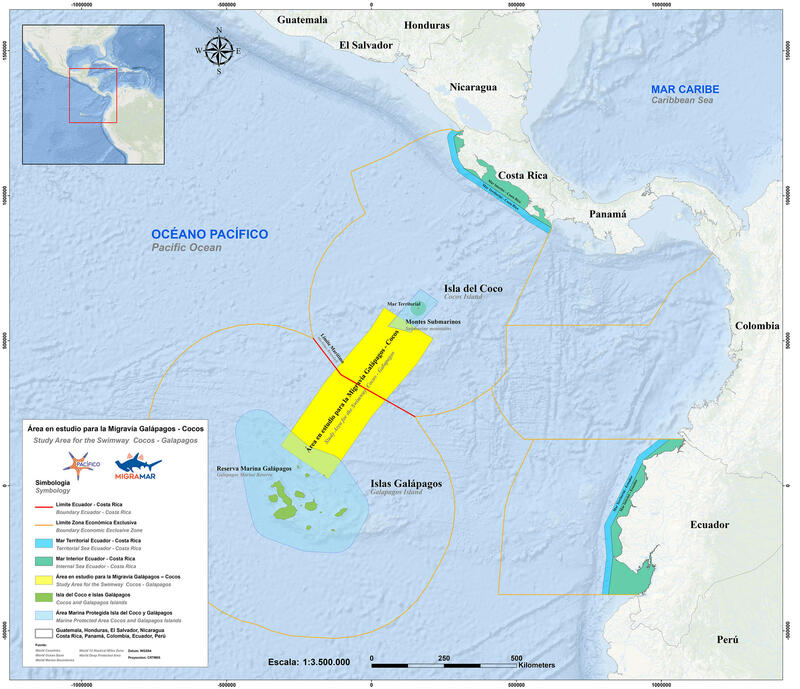 "So this was the first time we actually documented animals using these seamounts," Espinoza says. 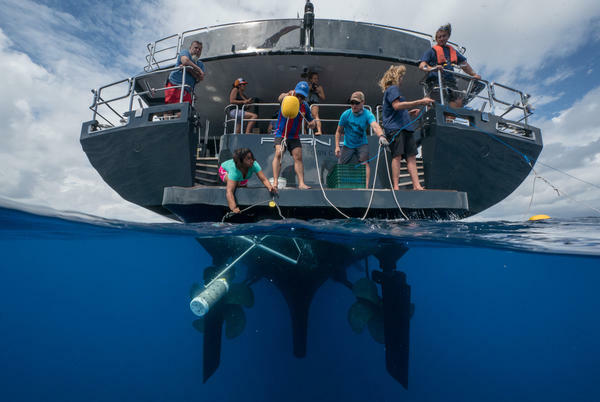 "We don't know exactly whether they are feeding or they're like stopping by or using these seamounts as navigation routes." Road signs, perhaps, or drive-through restaurants. Espinoza is at the University of Costa Rica, and the expedition was organized by a Costa Rican group called Pacifico. Zdenka Piskulich, president of the Pacifico Foundation, says it's a challenge to get people interested in some sort of fish corridor in the middle of the ocean. "But finally we have visual evidence that there is a huge abundance in this area that needs to be protected, that there really is a highway," she says. Cocos Island and the Galapagos already have protected areas for fish, but the highway isn't part of that, according to Lee Crockett of the Shark Conservation Fund, one of the effort's sponsors. "Once [sharks] get outside the protected area, its fair game," he says. "And there's lots of high seas fishing for tuna. It's mostly long lines, and they catch a lot of sharks and a lot of turtles." Some hammerhead shark species are endangered and others are in decline, as well as many turtle species. 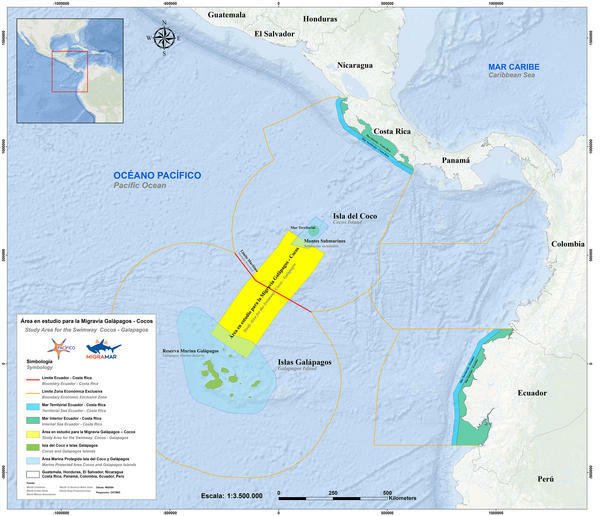 The research team and its sponsors are hoping to establish something new here: a marine protected area that's not just a patch of ocean or reef, but a wildlife corridor in the ocean that extends for hundreds of miles. "That's why we're excited about this as kind of the next step in conservation," Crockett says, "to establish these corridors or swimways between these protected areas so they get complete protection." It would be a highway that doesn't go through mountains, but above them. One with a great view, for sure, but unless you're a shark, probably not a place where you'd want to hitchhike. For the first time, scientists have filmed sharks traveling a 500-mile-long shark highway. It's in the eastern Pacific Ocean. And as NPR's Christopher Joyce reports, biologists hope to turn the highway into a protected wildlife corridor. 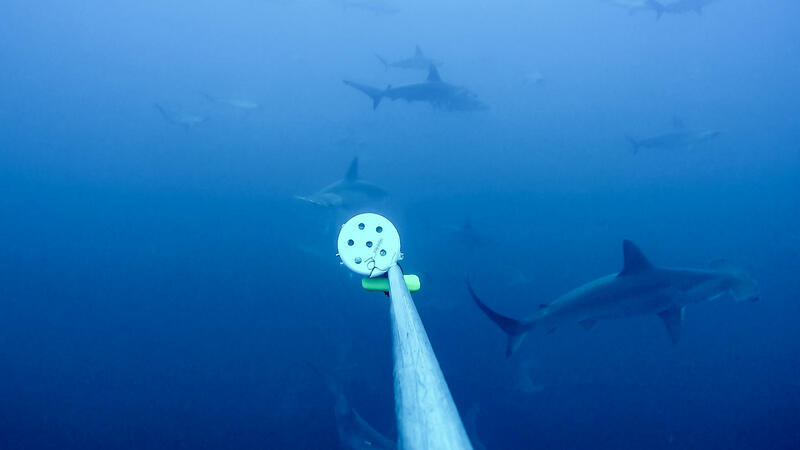 CHRISTOPHER JOYCE, BYLINE: Biologists have been attaching electronic tags to sharks near Costa Rica for years. They knew the shark sometimes traveled south to the Galapagos Islands, but they'd never actually witnessed it. To do that, they took some GoPro-style cameras and attached them to metal frames along with some bloody fish bait and dragged them behind a research vessel for almost two weeks. 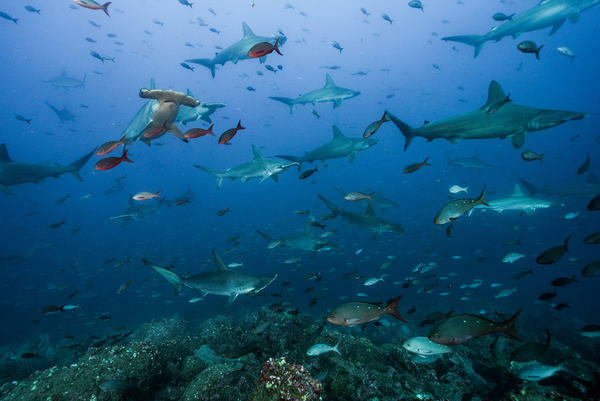 And they waited and waited until, says biologist Mario Espinoza, dozens of sharks swam out of the gloom and into view. MARIO ESPINOZA: We actually document over 16 species of sharks and fish, also sea turtles and dolphins. It's really surprising to see that many animals - amazing. JOYCE: Sharks dominated, mostly hammerheads but also thresher sharks and silky sharks. Sometimes a single video frame captured dozens of them. What they were witnessing is what appears to be a continuous swimway of large marine animals. It starts in Cocos Island in Costa Rica and extends to the Galapagos. The route follows a range of underwater mountains. Some of the tops of these seamounts extend fairly close to the surface. ESPINOZA: So this was, like, the first time we actually document animals using the seamounts. We don't know exactly whether they're feeding or they're, like, stopping by or using these seamounts as navigation routes. JOYCE: Underwater peaks as roadsigns maybe or drive-through restaurants. Espinoza is at the University of Costa Rica. The expedition was organized by a Costa Rican group called Pacifica Pacifico. Pacifico director Zdenka Piskulich says it's a challenge to get people interested in some sort of fish corridor in the middle of the ocean. ZDENKA PISKULICH: But finally we have visual evidence that there is a huge abundance in this area that needs to be protected, that this really is a highway. JOYCE: Among the sponsors is the Shark Conservation Fund. Its director, Lee Crockett, notes that Cocos Island and the Galapagos have protected areas for fish, but the highway is not part of that. LEE CROCKETT: Once they get outside the protected area, it's, you know, fair game. And there's lots of high seas fishing that goes on for tuna. It's mostly long lines, and they catch a lot of sharks and a lot of turtles. JOYCE: Some hammerhead shark species are endangered, and others are in decline - same with many turtle species. The team and its sponsors are hoping to establish something new here - a marine protected area that's not just a patch of ocean or a reef but a wildlife corridor hundreds of miles long in the ocean. CROCKETT: That's why we're excited about this as kind of the next step in conservation - is to establish these corridors or swimways between the protected areas so they get complete protection. JOYCE: The highway that doesn't go through mountains but above them - a great view for sure but, unless you're a shark, probably not a place where you'd want to hitchhike. Christopher Joyce, NPR News. Transcript provided by NPR, Copyright NPR.